Whether it's Spring or Any Other Season, the Floors Always Need Sweeping ... Ugh! Did you know you can sweep your floors all day long without thinking about it or using a broom? Yes that's right .... all you have to do is walk around your home with slippers that sweep for you. Do You Have Pets that Shed? Are you buried in animal fur? Do you need a rescue team to come in and find you and the kids buried in a fog of dog hair? Ok, sure it's not that bad (it could be?). Well, if you need a rescue, then get the entire family their own pair of dusting slippers. They come in sizes that fit men, women and kids. Are You Sick of Seeing the Dust on Your Hardwood Floors? You're not alone. Did you know that darker shiny hardwood flooring shows almost every speck of dust, especially when the sun beams down on them through windows (yah, you know that already) ... and did you know that's one of the reasons people now choose a flatter finish for their hardwood. An affordable choice for your cleaning party! Well, these slippers are also a great house warming gift for people moving into a new house. In fact, a creative basket of cleaning goodies to make life easier, is an ideal gift! 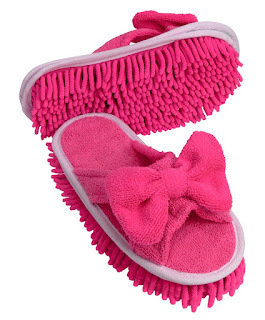 Add these slippers to your cleaning gift basket and they'll love it! Hopefully my brother and his wife don't read this article, because guess what they're getting from me? So How Do You Clean the Slippers that Do the Cleaning? It's easy. Just detach the bottom velcroed micro-fiber cleaning piece and toss them in the washing machine. Depending upon the style you choose, some come as an entire piece as featured in the photo here labelled 'another style'. 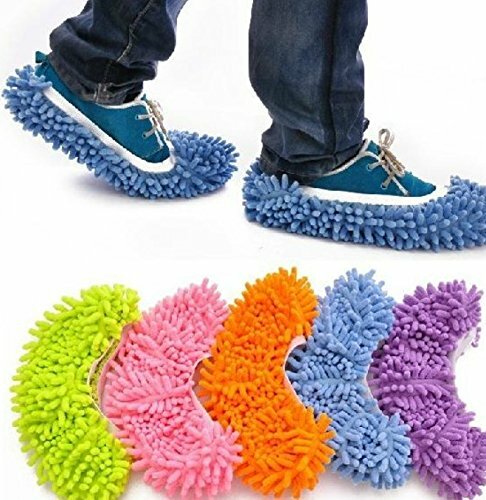 Get a pair for everyone in the family and have them wear their cleaning slippers throughout the day and at least you'll stay ahead of the dust! How About A Slipper Party? But if you're into wacky-party themes, you can hold a 'Help Me Clean My House Party' and everyone gets a free gift! A pair of cleaning slippers that you provide for each person as they enter and that they have to wear at the party. Sure, your house will be a mess of glasses, food and other party goodies, but at least your floors will look good! Best of all, no shoes on in your home, no bare-feet, and no smelly socks. All your guests will be wearing a new pair of cleaning slippers. Would it be expensive - well, if you compare these to other items you have to acquire for a party, this is in the range .... 10 Slippers would be about $70 to $150 bucks, depending upon the style you choose. I love these. The perfect lazy lady's household companion. me too Lorelei, great when you have pets! Genius invention! I love that they come in sizes for everyone. This really is a great idea and I do, indeed, have hardwood floors. This is perfect for homes that have hardwood floors throughout (and more and more seem to, especially with older homes where people take up the carpets and go back to the original hardwood floors or replace carpet with wood flooring as my brother just did). I may have to get a pair for my daughter -- their older apt in St. Louis has hardwood floors throughout and these cleaning slippers would be perfect! I like that baseboard idea, and it also might work on the bottom decorative trims on dressers and China cabinets. Brilliant idea! I have hardwood floors so this would be great! I love the idea of automatic sweeping!